The British Vehicle Rental and Leasing Association (BVRLA) and ACFO have met with Leeds City Council to discuss the city’s future Clean Air Zone at a roundtable event. Leeds Clean Air Zone will charge for non Euro 6-compliant taxis and lorries under current plans. Jointly hosted by the BVRLA and the council along with the Energy Saving Trust, the event was also attended by national and regional fleet operators and is the first of a number organised in cities across the UK that are planning Clean Air Zones (CAZ). 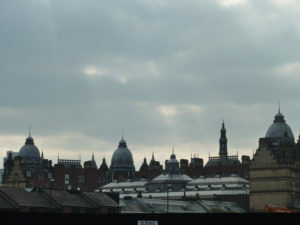 Leeds was listed in the December 2015 UK Air Quality Plan as one of five cities needing to deploy a CAZ by 2020 to ensure compliance with the EU Directive on air quality. The proposed Leeds City Council Clean Air Zone will charge lorries and taxis for access, unless they are Euro 6 compliant. It does not cover cars and light goods vehicles in line with the council’s view of creating at scheme that allows the city to hit national compliance levels within the shortest feasible timescale, whilst also minimising the negative impact. Final plans for CAZs are required to be submitted to central government by March this year by those local and city authorities identified as having severe air quality issues. To coincide with the Leeds event, the BVRLA has published a new factsheet outlining its proposals for a fleet-friendly air quality policy, urging policymakers looking at Clean Air Zones and other air quality measures to ensure schemes bring a managed transition for businesses and individuals as well as making sure Clean Air Zones are a catalyst for behaviour change and there are more incentives for low-emission vehicles.